The term “biotic” refers to any living think within an ecosystem. Within the rainforest, which covers about two percent of the Earth's surface but houses 50 percent of the Earth's plants and animals, this include animals, plants, fungi and microorganisms. Since the rainforest is the most biologically diverse ecosystem, there are thousands of biotic factors that fall into one of those major categories. Let's learn about some of these amazing living things. A biotic factor in the rainforest is any living thing, which includes rainforest animals, plants, insects, fungi and microorganisms. These aren't to be confused with abiotic factors, which are non-living things. The Nature Conservancy states that a four-square-mile patch of a rainforest contains 400 species of birds and 150 species of butterflies. Some rainforest species of animals have not yet been identified and named. Rainforests likely carry many species of animals because they are some of the oldest ecosystems on the planet. Rainforests also have temperatures around 75 to 80 degrees year-round, so animals do not have to worry about surviving cold temperatures or finding adequate food supplies. Of the many species of animals in rainforests, it is estimated that over 50 million are invertebrates. Some animals of the rainforest species include poison dart frogs, parrots, toucans, beetles, butterflies, praying mantis, leafcutter ants, howler monkeys, anteaters, jaguars and coral snakes. The variety and role of plants within the rainforest help give this ecosystem its character. 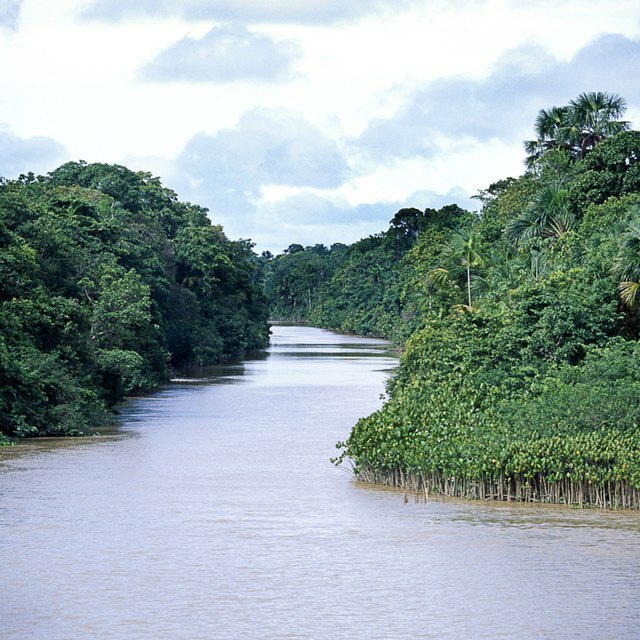 A rainforest is almost entirely self-watering; plants release water through transpiration, and this water becomes low-hanging clouds that produce rain or at least keep the rainforest humid. Over 2,000 plants of the rainforest contain anti-cancer properties, yet fewer than one percent of plant species have been analyzed for their medicinal value. Rainforest plants contribute important products like timber, cocoa, coffee and beautiful flower blooms, such as those from orchids. Fungi and microorganisms perform similar functions in the rainforest ecosystem, including decomposing dead things and providing food sources. Without microorganisms or fungi, dead organic matter on the forest floor would not decompose at a reasonable rate, and plants would not have the nutrients they need to survive. Microorganisms also aid digestion in animals of the rainforest, and fungi are food sources for invertebrates such as ants and beetles. Species within the rainforest ecosystem depend on each other for survival. Azteca ants, for example, live on Swollen Thorn Acacia Trees. The trees provide the ants with food and a place to live, and the ants protect the tree from predators by fighting intruders and preventing other plants from growing around the tree. Rainforest animals also tend to have adaptations that allow them to eat foods from plants that other animals cannot eat. For example, toucans have large, strong beaks that let them eat nuts that other birds with smaller beaks cannot eat. Fruit trees rely on animals to eat their fruits and disperse their seeds through their droppings. Batema, Cara. "Biotic Factors of the Rain Forest." Sciencing, https://sciencing.com/biotic-factors-rain-forest-24044.html. 17 April 2018.